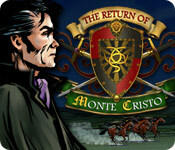 The romantic hero Edmond Dantes is on a quest to discover Mercedes’ killer, and bring them to justice, in The Return of Monte Cristo, a beautiful Hidden Object game! Explore gorgeous scenes as you piece together valuable clues and solve the murder of Dantes' beloved. Travel to Paris while figuring out perplexing puzzles and experiencing an immersive plot, in this sequel to Alexander Dumas’ classic tale.